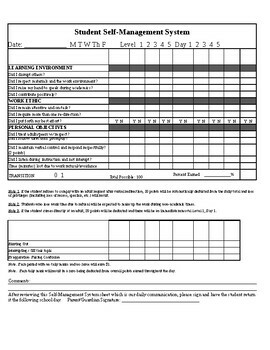 This self-monitoring sheet is something I use to track behavior in my 4th-5th grade self-contained classroom for students with emotional/behavioral challenges. The student completes the report after each subject and then reviews it with the teacher. Each box is worth one point for a maximum of 100 points earned in a day. If the student fails to meet the objective, then he receives a zero for that specific area. Each The students are provided with money at the start of each day to be used in the classroom store, Each zero costs one dollar.